Goldfish seem to be very prone to parasites. My fish health pages have extensive information on many topics which are all relevant to goldfish. Fancy goldfish are prone to problems swimming and maintaining their buoyancy. They may lay on the bottom, be upside-down, float at the surface (sometimes upside-down), swim with their rears in the air, or otherwise have trouble getting around. This is much more rare in normal kinds of goldfish (common, comet, and shubunkin) as they are not deformed. Fancy goldfish are deformed mutations that would never survive in the wild. They are much more delicate. The fatter the bottom, the more abnormal they are. Their swim bladders may be in the wrong place. They could have swim bladder disease. With any goldfish, swimming problems can be associated with a malfunctioning swim bladder, kidney disease (with swelling), tumors (bacterial or cancer), hard food, or any illness temporarily. By hard food, I mean dry foods given dry that may swell in the goldfish's gut. They can also produce gases. For that reason, people often suggest pre-soaking food a few minutes in water or feeding, at least when a problem appears, cooked, peeled peas and other fresh vegetables (cucumber, spinach, kale, anacharis sold as aquarium plant, etc.). It may also help to maintain low levels of salt (a tablespoon of aquarium salt (NaCl) per 5 gallons. Aside from that and a good diet and good tank maintenance (clean water), there is little treatment that will help a goldfish get around that is swimming abnormally. Sometimes, such fish will recover on their own. Other times they will deteriorate over time until they can no longer feed and then starve to death. Often, they do not change but can function just fine even though they spend some time upside-down or sideways or whatever. If the fish is abnormally fat, see the section Why Is My Fish Fat?. 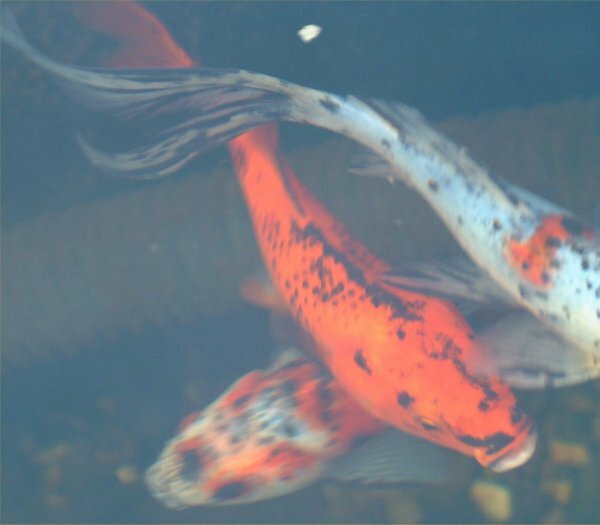 Note that fancy goldfish are normally fat-bodied and some kinds even appear to have dropsy like the pearl scale but that is normal for them. I have gotten many questions about goldfish changing color. It is normal for goldfish to change color throughout their lives, but especially the first two years. For more details, see my section on color changes on my goldfish breeding page. Also, some people note black marks on the edges of their goldfish's fins. If the area was injured, then this indicates that the fins are trying to heal and is a good sign. The black is often dead cells. Also, some of the normal color changes may occur along the edges of the fins. Only if there appears to be black spots that are small in various areas, is black spot (a parasite) a concern. If the area does not appear to have a bacterial or fungal infection, there is probably no cause for worry. 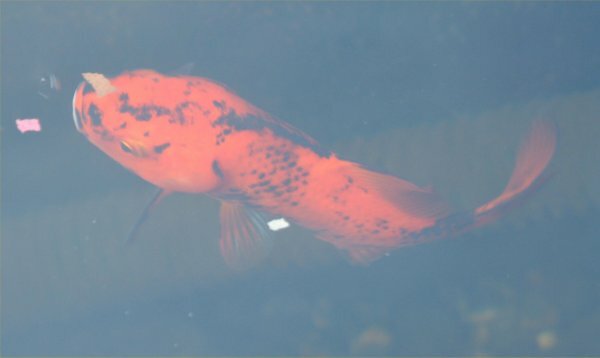 Here is a photo of a young goldfish in my 1800 gallon pond in the midst of his/her color change when a few inches long in April of 2003. Pauline sent these photos of her goldfish on 10/12/06. The goldfish are a bit anorexic and may have medical problems but the black spotting is a color change in progress. I put these photos on my site to show what a goldfish changing color looks like. Many people also ask about torn fins. First, will they grow back? It depends on how damaged the veins or supporting structure of the fins are. If the support structures (like the veins of a leaf) are gone, the fin will not grow back fully. If they are intact, it may grow back completely. Either way, the fins will probably never look like they used to look. Even if the fin is totally gone, it may grow back partially, but will probably look abnormal. Fins are often ripped by other fish or injury or sometimes from an infection. So, the second question is how do you treat torn fins? If the fins show no signs of fungus or bacteria, then try salt and MelaFix. If the fins have fungus, use a fungicide. If there is an infection, use antibiotics. Some antibiotics will kill good bacteria so be careful. Erythromycin such as found in Maracyn by Mardel does not harm the good bacteria. Salt treatment should be about a tablespoon per 2 to 5 gallons (I use a tablespoon per 5 gallons at all times). Use only sodium chloride like that sold for aquariums or ponds or marine salts. Do not use salt with iodine such as table salt. Salt will stave off infection and help prevent electrolyte loss to the water. For more on salt, see this page. Also, MelaFix by Aquarium Pharmaceuticals may be added which contains tea tree extract. It is safe for everything but will cause some foaming on the surface and smells a little bit. Be sure to aerate well when using it. Tea tree is a natural antibiotic and antifungal. A little aloe added to the water may also help aid healing. Or, add something like Stress-Coat which contains aloe. It is also a dechlorinator. After a fin is injured, when it is properly healing, the edges often turn black. This is normal and means the wounds are healing as expected. For similar information to treat physical injuries, see the Pond Tidbit #1 in the March 2003 Pond Newsletter. Return to Main Goldfish Page.